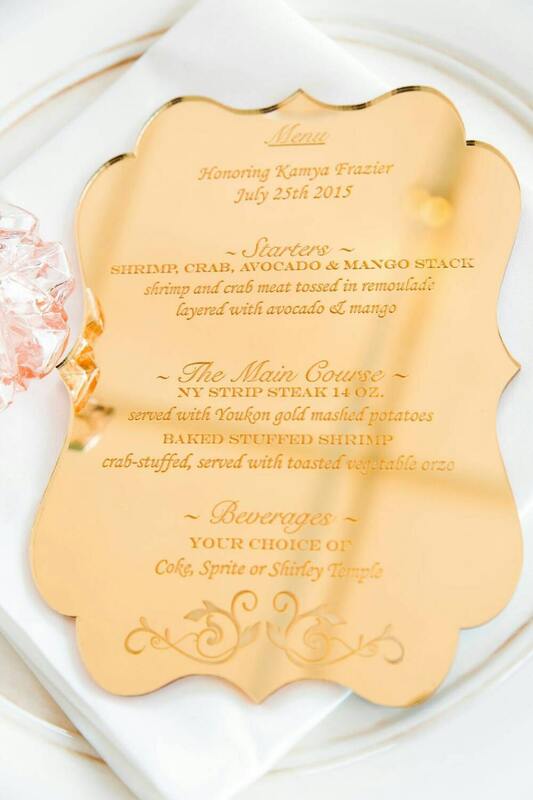 These gorgeous laser-cut etched menus are absolutely stunning and create a memorable event for guests and hosts alike. Our custom and personalized laser cut etched acrylic menus can be placed along with your table settings for each guest, used as table décor, photo props and so much more for a wedding or any special occasion. Pricing listed is "starting at" price point, price will vary on design, detail, quantity, etc. Don’t worry about paint or wood chipping; these long lasting gorgeous acrylic menus are made from the best quality and 100% made in USA. We design and make all of our items with our own machines and hands, no outsourcing here! Ordering instructions: You may select your color, size and quantity and add to cart. Then you can either message us the text font/design preference, leave details in the "notes to seller" section at checkout or you can message for more details and information prior to ordering.